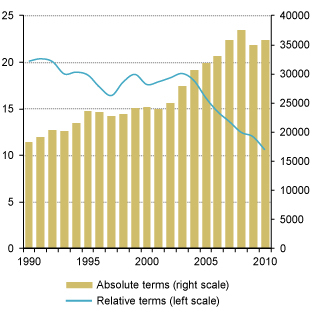 The per capita level of gross domestic product Gross domestic product (GDP) is an aggregate measure of production equal to the sum of the gross value added of all resident institutional units engaged in production (plus any taxes, and minus any subsidies on products not included in the value of their outputs). more(GDP) provides a rough summary indicator of the average living standard. Vast disparities in GDP per capita Gross domestic product (GDP) per capita is gross domestic product divided by population. (Ratio and $ per capita) Source: UNCTAD secretariat calculations, based on UNCTADstat Note: Absolute terms calculated as differences between nominal GDP per capita of developed and developing economies . 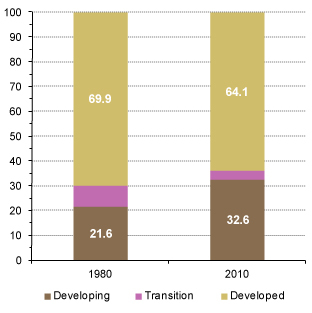 (Percentage) Source: UNCTAD secretariat calculations, based on UNCTADstat . Catching up has broadened since 2003 and may have accelerated further since the global crisis, albeit in a less benign way, since it is owing to a falling off in growth in developed countries that also risks holding back income growth in developing countries. Source: UNCTAD secretariat calculations, based on UN/DESA, National Accounts Main Aggregates database and World Economic Situation and Prospects (WESP) 2011; ECLAC (2011); OECD (2011); and national sources. At its peak, the global crisis severely affected economies around the globe. Its impact has proved more lasting in the case of key developed countries, however. 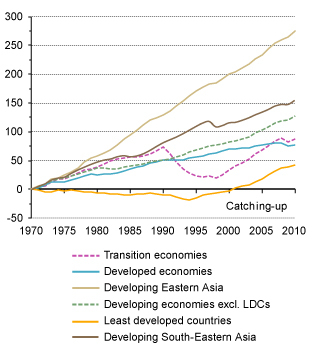 Led by East Asia, developing countries at large have rebounded more vigorously from the global calamity. To begin with, not all developing countries had experienced the crisis as an absolute decline in income levels but as a slowdown in their rate of growth. Furthermore, only a small group of transition economies concentrated in Eastern Europe suffered grave declines in absolute income levels. These economies also seem to find it similarly hard to recoup lost ground, as do the developed countries that were at the heart of the global crisis. Meanwhile, developing countries at large have not only regained and exceeded pre-crisis GDP levels, but also returned to their pre-crisis growth path. This contrasts with the situation in developed countries. Barely regaining their pre-crisis income levels, as a group, developed countries continue to operate well below their pre-crisis growth trajectory. The situation is most critical today in those European countries that share the euro. 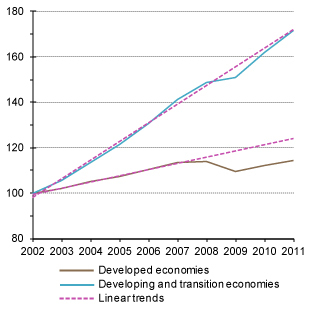 ((Percentage of world GDP) Source: UNCTAD secretariat calculations, based on UNCTADstat . 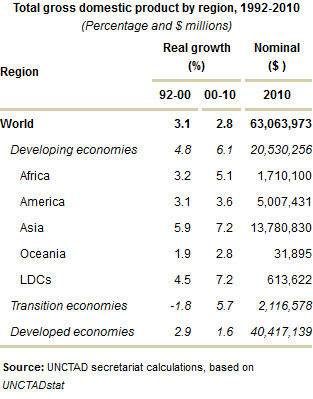 The balance in the global economy is shifting fast (Table) . The global crisis has accentuated the shifting balance in the world economy.